Following yesterday's announcement of the Lenovo U300s ultrabook, Acer and Toshiba have thrown their hats into the ring: Acer with its Aspire S3, and Toshiba with its Portege Z830. Let's start with the similarities: Both feature a 13.3" screen with a 1366x768 resolution, Sandy Bridge ULV processors, DDR3 memory, an HDMI port, an SD card reader, wi-fi, a webcam, and bluetooth. Both also feature SSDs of varying capacities, though the Aspire S3 will offer a higher-capacity but slower mechanical HDD option (sources indicate that HDD models will feature an embedded SSD to retain the fast boot times required by Intel's Ultrabook spec, but specifics are hard to come by). Both will also launch later this year: Toshiba is commiting to November, while Acer declined to be more specific. And the differences: the Toshiba model also features built-in Ethernet, a VGA port, a backlit keyboard, and a third USB port, while the Acer model is slightly thinner at 0.51 inches but heavier at about 3 pounds (the Toshiba is 0.63 inches high and weighs about 2.5 pounds, though it should be noted that the weight of each model may vary based on component selection). The Toshiba will also be cheaper, starting at around $1,000 (compared to the Acer's $1,179). Looking at these early Ultrabooks, it's becoming clear that these laptops, like netbooks before them, are going to have to fight to differentiate themselves. In these particular models, this is mostly being done with ports: the Acer is the only one to lack a wired Ethernet port, while the Toshiba is the only to offer a VGA out and a third USB port. This sort of heavy competition can be good, to a point, but I'm hoping we don't see the same thing we already see in the netbook and low-end laptop market: dozens of unexciting computers that are, for most intents and purposes, indistinguishable from one another. The problem with most laptops is that when they try to stand out in a good way, the fail and end up doing the exact opposite. A "stock" Windows laptop that had no cruft or extra crap would actually do quite well in the market I believe (but it wouldn't be subsidized from those "free" apps). That's actually where Macs come in to play. You buy a Mac, you get 0 crapware preinstalled. Also consider that Apple makes a solid unit with a decent LCD panel, and maybe they start proving they are worth that extra money. While I'm not really an Apple fanboy, I do like their product design and general build quality. Apple has about 90% of the market share in the over-$1000 market, where, despite Intel's intentions, most of the Ultrabooks will be competing in. "I'm guessing that for the first year or two the vast majority of Ultrabooks will be over $1000, at least the ones with comparable specifications to the MacBook Air line. " First as Anand pointed out, a non-SSD laptop is NOT an ultrabook. 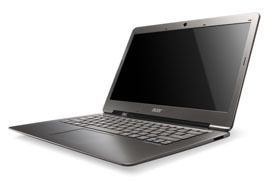 The real problem with all the ultrabook models released so far, is that they are inferior Apple MacBook Air clones. Sure they have the similar hardware (CPU, GPU, SSD) but they have smaller batteries, poor low resolution screens, and inferior build quality. Worst of all they will be roughly the same price as the Air. As CNET showed it is possible to completely replace OSX with Windows 7. The problem is that while most everyone dislikes CES ware, it lowers the cost of the computer by 10-20%. so either no crapware, and higher prices, or otherwise. At these sort of price range they are going to have a hard time winning against Apple. 13" Inch Macbook Air Start with $1299, comes with $100 discount on HP Printers, and $100 App Store Coupon + $50 discount if you are student. Those who are willing to spend over $1000 will surely be able to afford just a little more for Macbook Air.